When my husband and I moved to Fergus Falls from the Twin Cities back in 2006, we knew our lives would change. One of the things we worried about was lack of access to the arts and culture. We found out quite quickly our worries were groundless. Soon, we were immersed in everything there was to offer in our small city and in the surrounding communities. There was so much—music, theatre, dance, art exhibits, festivals, bike and walking trails, museums, nature preserves, art parks and more! In the eight-plus years we have lived here, we’ve put a lot of miles on our car, a lot of beautiful local art in our home and a goodly amount of local foods in our pantry. 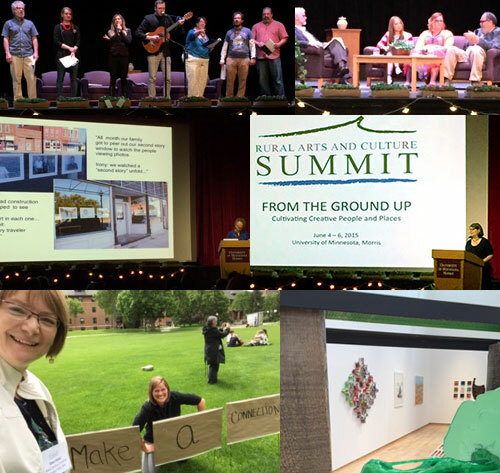 All of this is to say that, thanks to the arts and culture in west central Minnesota, my husband and I have contributed our fair share to helping strengthen the regional economy! We learned how Native Americans in Maine were reviving the art of basket weaving, and the economic impact it was making on both individuals and communities. We learned that the arts can be used to give those without a voice, a voice; and can provide that opening to create connections across societal divides. We saw how grassroots organizing around the arts has enriched communities and brought people together. We learned how the arts and culture impacted one community so much, the city council decided to designate the entire city as an art campus. We learned how to tell our own stories about rural life through writing, skits, drawing…even drumming! Learn more, see more, hear more at https://www.facebook.com/racsummit or type in #racsummit on Twitter.